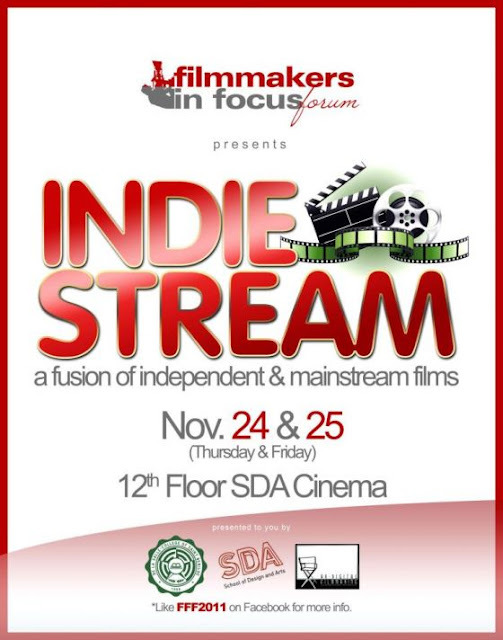 Filmmakers in Focus Forum (FFF) presents "Indie Stream: A Fusion of Independent and Mainstream Films" on November 24-25, 2011 at the 12th floor of School of Design & Arts (SDA) Cinema of De LaSalle-College of St. Benilde in Manila. FFF is a student-formed project of FLMART2 (Film Art) classes, a culminating film theory class under the guidance of the Digital Filmmaking Program Chairperson Prof. Jag Garcia, together with the faculty handling FLMART2 classes. This provides students the chance to witness an in-depth discussion on the current issues and trends of Philippine Cinema specifically the filmmakers and their works. For this year’s theme, indiestream/ a fusion of independent and mainstream cinema, it basically highlights the cross-over of recent Philippine filmmakers from independent to mainstream and the reverse of it.